The Perth Mint’s First-Ever Gold and Platinum Bi-Metal Coin! History was made when Australia’s prestigious Perth Mint released its first Australian Wedge-Tailed Eagle coins. Never before had a former chief engraver from the U.S. Mint worked with a world mint to create a legal-tender coin. And it wasn’t just any former chief engraver, but the legendary John Mercanti, designer of the famous American Eagle Silver Dollar reverse. Now the Perth Mint has taken this eagle series to even greater heights by releasing the first gold-and-platinum bi-metal Wedge Tailed Eagle! Not only is this incredible release a first for the Wedge Tailed Eagle series, but it’s also the first-ever 1½-ounce gold-and-platinum bi-metal coin for ANY series released by the Perth Mint! 2018 marks both the fifth year this ground-breaking series has been issued, as well as the release of the third Mercanti-designed Wedge-Tailed Eagle reverse! In 2014 and 2015, the series featured Mercanti's vision of an eagle in flight, ready to land. The next two years displayed a perched eagle with a stoic and majestic gaze. A new design debuted in 2018, one that, along with all designs to follow, will be struck for one year and one year only! The design on this unique bi-metal coin features a baby eaglet being watched carefully by its mother while the father of the family is shown swooping in, ready to come home to the nest. The inner center is minted in three-quarters ounce of 99.99% gold while the outer ring is minted in three-quarters ounce of 99.95% platinum. When you turn it over in your hand and marvel at its beauty, you’ll understand why the Perth Mint's reputation for innovation and producing coins of superior quality is unsurpassed. All the details are engraved on the obverse along with Ian Rank-Broadley's profile of Her Majesty Queen Elizabeth II. 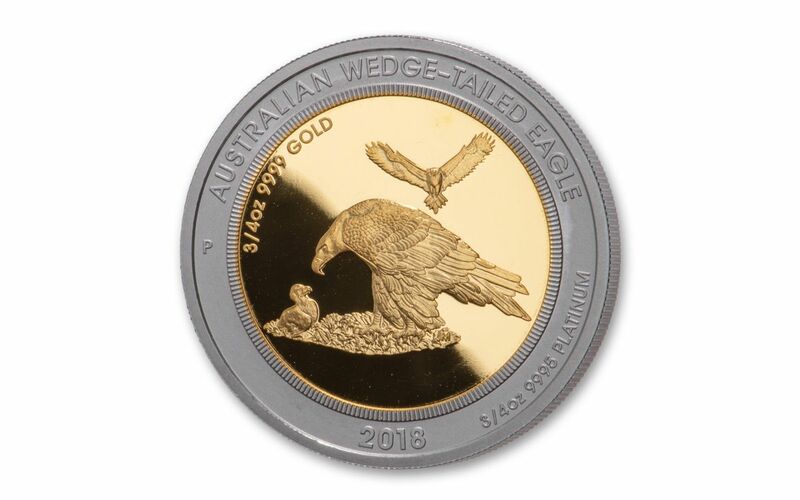 The coin’s gold and platinum content, the year 2018 and the signature “P” mintmark join the wedge-tailed eagle family on the reverse. 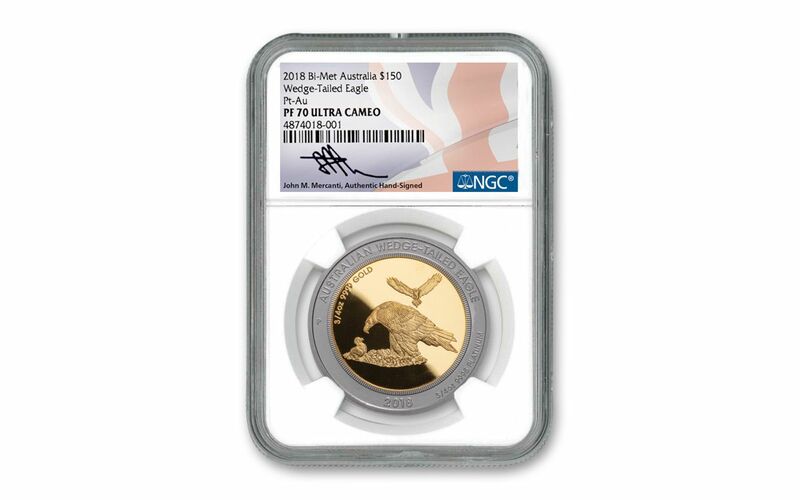 In addition, your 2018 Wedge Tailed Eagle Gold & Platinum Bi-Metal coin has been graded by the Numismatic Guaranty Corporation (NGC) as being in perfect Proof-70 (PF70) condition, a distinction that means your perfectly-graded proof will have ZERO imperfections – showing all features and fields exactly as the engraver and mint intended! What’s more, this Wedge Tailed Eagle comes sonically sealed in an acrylic holder with a special Australian flag label that was personally signed by John Mercanti, the U.S. Mint’s 12th Chief Engraver! This match between John Mercanti, the most prolific designer in United States Mint history, with the world-renowned Perth Mint is a marriage created in collector heaven! But if you want to add one of these amazing coins to your collection you will need to act fast. The Perth Mint struck only 150 of these gold-and-platinum bi-metal proofs, a number far too few for the thousands of collectors who would like to have one of these Wedge Tailed Eagles soar into their collection. Don’t wait; click one to your cart now! PERTH MINT’S FIRST-EVER 1.5-OUNCE GOLD & PLATINUM BI-METAL COIN – Not only is this the first gold-and-platinum bi-metal coin in the Perth Mint’s immensely popular Wedge Tailed Eagle series, but it’s also the first-ever 1½-ounce gold-and-platinum bi-metal coin for ANY series released by the Perth Mint! AUSTRALIAN COINS DESIGNED BY FORMER U.S. MINT CHIEF ENGRAVER – Designed by Former U.S. Mint Chief Engraver John Mercanti, the Perth Mint’s Wedge Tailed Eagle series represents the first time a former chief engraver from the U.S. Mint worked with a world mint to create legal-tender coin! This year’s design features not just one, but an entire FAMILY of exceptional eagles. 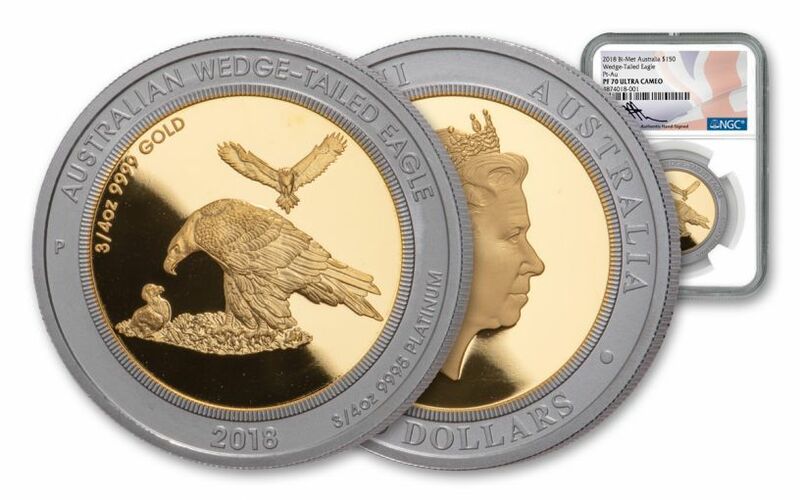 STRUCK IN HIGHLY PURE GOLD AND PLATINUM – The inner center of the 2018 Australia Wedge Tailed Eagle 1½-Ounce Gold/Platinum Bi-Metal coin is struck in three-quarters ounce of 99.99% gold while the outer ring is struck in three-quarters ounce of 99.95% platinum. AUSTRALIAN LEGAL TENDER – Each 2018 Australia Wedge Tailed Eagle 1½-Ounce Gold/Platinum Bi-Metal coin is $150 Australian legal tender. GRADED IN PERFECT PROOF CONDITION – Your Wedge Tailed Eagle 1½-Ounce Gold/Platinum Bi-Metal coin has been graded by the Numismatic Guaranty Corporation (NGC) as being in perfect Proof-70 (PF70) condition! PERSONALLY SIGNED BY JOHN MERCANTI – This Wedge Tailed Eagle comes sonically sealed in an acrylic holder with a special Australian flag label that was personally signed by John Mercanti, the U.S. Mint’s 12th Chief Engraver! AN EXTREMELY LIMITED MINTAGE EVENT – The Perth Mint has set the mintage for the 2018 Australia Wedge Tailed Eagle 1½-OunceGold/Platinum Bi-Metal Proof at only 150! 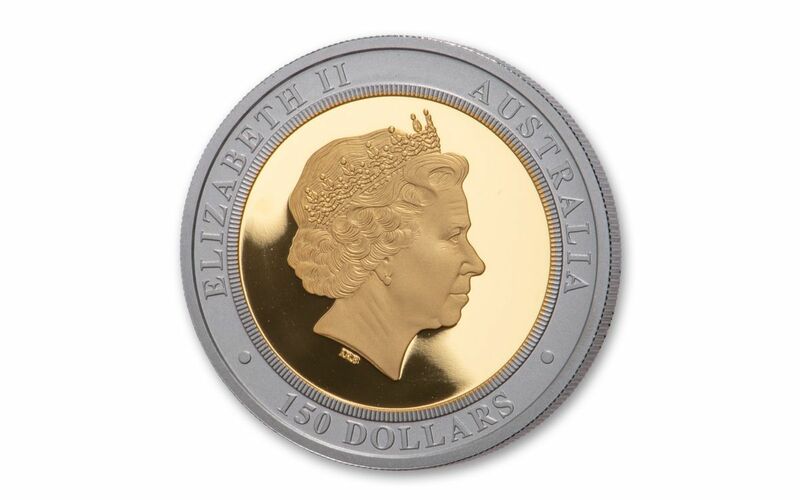 That's right – that's only 150 of these coins for Wedge-Tailed Eagle collectors around the world! And, unless you live in Australia, your ONLY source for this stunning silver coin is GovMint.com. Order yours now!